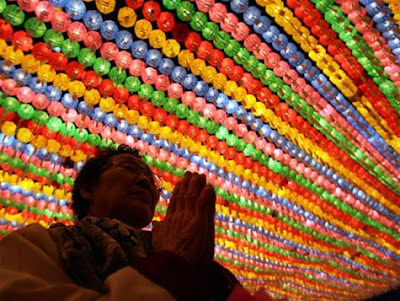 Worshipers walk under colorful lanterns as they celebrate the coming birthday of Buddha at Chogey Temple in Seoul. Buddha was born approximately 2,553 years ago, and his official birthday is celebrated on May 2 in South Korea. Sure do wish and pray for those in charge of 'all that,' though...nonetheless. I do enjoy the drama, and the colors and the lights. Just don't care too much for hardships and lack of food, shelter and clothing. Gosh, I do wonder why? Seems "THEY" would rather blame pigs. 'Inspire' might be a greater word.